RUSH: Robert, West Palm Beach, great to have you on the EIB Network, sir. Hello. CALLER: (garbled cell) Hey, Rush. It’s an honor to speak to you. I’ve been listening 20 years and finally got through. Let me get to the point quick. This whole John Paul Stevens thing really brought home something to the forefront in my mind. How in God’s name do these Never Trumpers — and I’m talking about the ones who claim to be conservative. How do they justify basically endorsing Hillary without endorsing her when they know damn well that the Supreme Court is at stake? They know we would have lost the Supreme Court! How can they claim to be conservatives? RUSH: Well, see, that is, sadly, the question — and it’s a great question. How in the world can these Never Trumpers, these intellectual conservatives who have been advocating for and writing and submitting conservative policy papers for decades…? How could they have supported anything that would result in Hillary Clinton appointing justices to the Supreme Court that would keep it in ownership of the left for the rest of their lives and longer? And the only answer I can come up with is at the end of the day, they really aren’t conservatives, first. They can’t be. 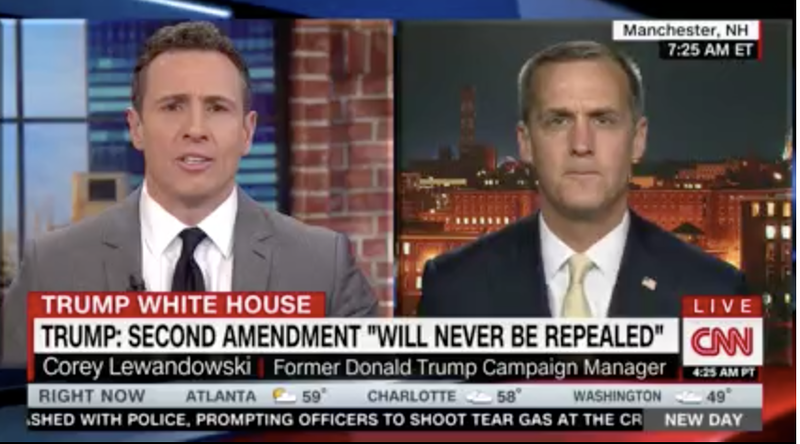 RUSH: On CNN’s New Day today, Fredo Cuomo spoke with former Trump campaign manager Corey Lewandowski about Trump’s tweets about Justice John Paul Stevens calling for the repeal of the Second Amendment. CUOMO: Nobody’s asking to repeal any amendment. But the point is you guys are using it as a bogeyman. CUOMO: He’s a retired Supreme Court justice, and it’s a distraction, and it keeps us apart. I just don’t get it. CUOMO: I know who he is. But he’s not a player in this. LEWANDOWSKI: — making this recommendation. He is a player! CUOMO: No, he’s not. He doesn’t lead an organization. He’s not an elected official. There’s no momentum behind any call like this in Congress. CUOMO: I know who he is. LEWANDOWSKI: — in the highest court in the land. CUOMO: I know who he was. LEWANDOWSKI: He still has influence amongst those individuals. He’s trying to influence those people to make decisions based on a tragedy which took place in Parkland. This justice went so far to make an outrageous, outlandish claim to potentially repeal the Second Amendment. CUOMO: He’s not a player. RUSH: Stop it. Stop it. This is so silly. Here’s Fredo Cuomo demonstrating he’s not qualified to be in this job. 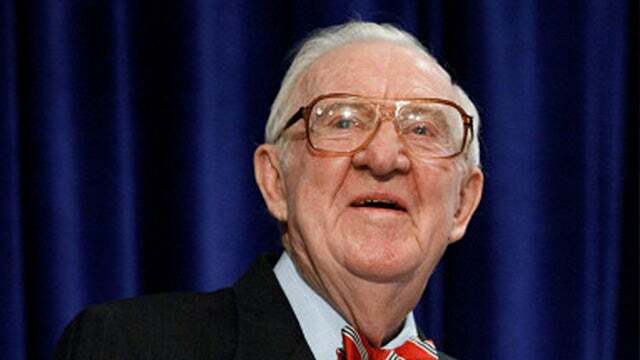 If Justice John Paul Stevens is irrelevant and doesn’t mean anything, why did the Washington Post publish his stupid op-ed? And after that stupid op-ed was published, liberals, before they realized what was happening, quickly ran to embrace it because it is exactly what their long-term objective is, repeal the Second Amendment and confiscate all weapons from law-abiding citizens. There’s no two ways about this. This is exactly what they want just like they want amnesty for every illegal immigrant in the country, but they don’t dare say so. 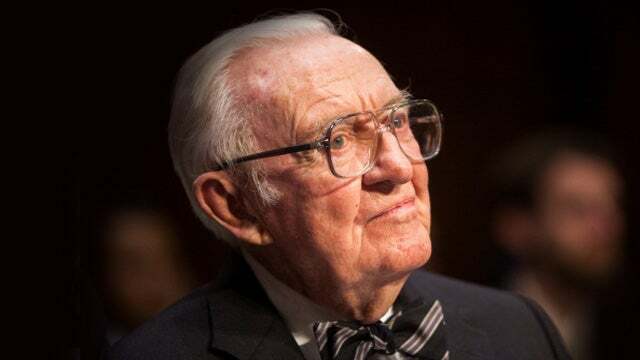 Well, Justice Stevens came out and wrote the op-ed, and there it was; it was right there in the Washington Post. And that is all that’s required to give it weight, to give it serious consideration. And some leftist leaders ran to embrace it. So here now comes Fredo Cuomo, “He’s nobody! He’s not an elected official! He doesn’t run an organization. He’s a former justice. He’s a former justice. It doesn’t mean anything to anybody!” Fredo, you’ve gotta be very careful, because you’ve just disqualified 80% of the liberal commentariat, if that’s what they have to have in order to have credibility. If they gotta be a member of an organization, if they have to lead an organization, if they have to have some current position on something, you’ve just eliminated over 80% of your support base as being qualified to weigh in on something, because they don’t have any weight, they don’t have any meaning, nobody listens to him. This guy is a former Supreme Court justice. Fredo Cuomo. “He’s a bogeyman. You guys are using him as a bogeyman. Nobody’s seriously talking about repealing the Second Amendment.” The hell they’re not! And the hell they haven’t been! Where else does this go? If they don’t mean that, if they don’t mean ultimate confiscation of all weapons, then what is this about? “That’s right, Mr. Limbaugh, it’s about assault weapons. We just want to eliminate assault weapons. It’s like the Parkland school kids are saying, they’re fine with a pistol in the home.” Yeah, not for long. It’s patently obvious what they want. They have been forced now to admit it, and now they got leaders like Fredo Cuomo trying to walk it back and hide it back under the rock that they’ve been using to hide it all of this time. Now, to Fredo Cuomo, “He’s a nobody, he’s a nothing, he doesn’t lead anything, he’s a former Supreme Court justice.” And that doesn’t matter? That makes it even more appalling. Folks, if you ask me, a Supreme Court justice is supposed to be a constitutionalist. Supreme Court justices, at the top of the heap of judges, swear an oath to defend and protect the Constitution. Here’s a former justice, who, by the way, has been kind of a left-wing radical for a number of years, including his time on the court, to suggest that it’s outmoded, it was written in the 1800s, has no appeal to today, why, we just might as well repeal it. Here, on that point, give me line 2. This guy’s not ready to go next, but Matt, get yourself together here. I’m gonna count down from 10 and I’m gonna come to you. Are you ready? I didn’t want to go to you immediately ’cause you’d be choked up and you’d be nervous because you weren’t prepared to be next, but you are next. Ten, nine, eight, seven, six, five, four, three, two, one. Matt, Bristol, Connecticut. You’re next. Welcome. CALLER: Rush, I’ve been listening to you most of my adult life. It’s a great honor to talk to you. CALLER: Yeah, I hear the argument that when the founders wrote the Second Amendment they couldn’t imagine weapons of today. I would argue the fact they were more likely to foresee the evolution of firearms than the advent of the internet or cable news when they wrote the First Amendment. RUSH: Precisely! There’s no way the founders could have ever dreamed of the technology we have today. They could not have dreamed of the mechanisms we have to freely speak and broadcast it and amplify it. RUSH: And with guns, I would maintain to you the founders were immensely prescient on guns. They knew that guns were killers of mass targets back when they had them. RUSH: There were bombs back then, there were rockets. Remember the rockets’ red glare in the star-spangled? They knew all about what rifles and their ammunition could do. And they also understood free speech. They understood its clinical, constitutional importance to freedom. That’s why it’s number one. That freedom to assemble, right to property, number one. They knew. It’s what makes it a brilliant document. They knew. Well, you could also say, “Hey, these founders, these racist slave owners, if they ever could have envisioned the internet and cell phones, satellite communique, they would have never written the First Amendment.” If the left ever thinks they can use that to persuade people, they will. They’re trying it here on the Second Amendment. They’ve been trying it for a long time. In fact, every aspect of the Constitution they hate. They always try as something to ratify their belief that the founders never intended this. The founders could not have foreseen what our society has become, if they had known, they would have never. You think the founders wanted there to be hundreds of millions of guns in America? No way. They’ve used that, they’ve trying to persuade people to join them in confiscating guns and eliminating the Second Amendment, repealing it. If they ever make any headway on it they’re gonna try it on Amendment One because believe me, if there’s an amendment they’d really love to get rid of more than number two and that’s number one. They’re already doing it without getting rid of it. On college campus they are effectively silencing people that they don’t want to hear. And you are seeing more and more surveys where these social butterfly social snowflakes, whatever, actually think that violence is appropriate in certain circumstances where threatening speech is uttered, violence is called for. So make no mistake who these people are. Do not undersell them. These people will throw this country and this Constitution upside down the moment they think they have a chance to. They don’t like it, folks. They’re not seeking common ground. There isn’t any anyway. They’re not interested in compromise. In fact, to them, compromise is death. If anybody on the left ever agrees to compromise on one of their core beliefs, they are certain that that will be seen as something less than full commitment to the cause, and they will never allow that to be said or seen. So they’re never gonna compromise. We’ve gotta stop believing the illusion that there is something to compromise about and that there are people to compromise with because neither are true. They’re not interested in it. They don’t want to peacefully coexist with you. They don’t want you around. They don’t want to have to deal with you. They don’t want to debate or argue. They don’t even want to hear what you think, much less find any overlapping common ground that we can come to mutual agreement on. That, to them, would be selling out. And their leaders will never permit it. Our leaders, on the other hand, are seeking it, to show them that we don’t hate them, to show them that we’re not what they think they are. It doesn’t matter what they think we are. All they think is, we’re not even qualified. We don’t have any rights. Their opposition is to one thing: conservatism and everything that it is. Their primary number one enemy is conservatism and conservatives, us. It is not external threats to the United States. It’s us. They view us as the nearest obstacle to their utopia or to their dreams or to their success. We are the immediate obstacle standing in the way. They want no part of us. This is how young people are being taught.